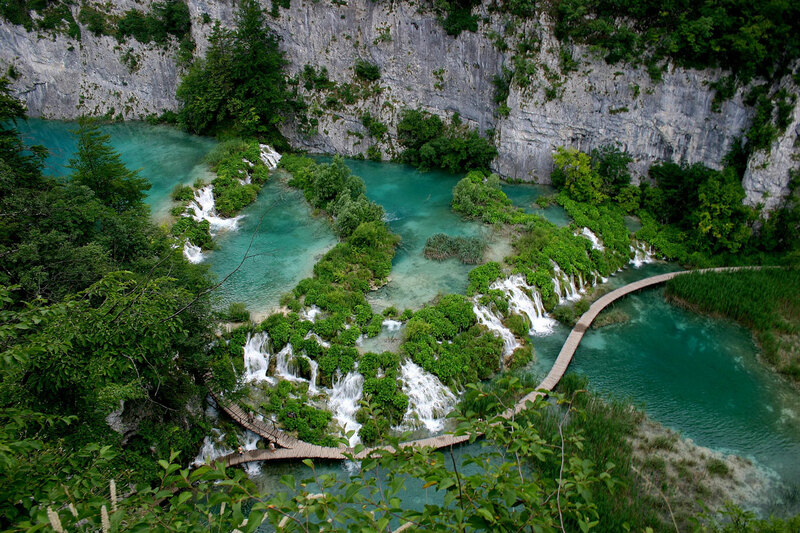 Croatia, the country of great natural beauty, is home to 8 national parks and 11 nature parks. The oldest, largest and the most beloved among them is Plitvice Lakes National Park. It is a must-see on every travel bucket list as well as the most visited site in Croatia. The Plitvice Lakes National Park is a place of unique natural beauty. What makes Plitvice Lakes so unique is the process of tufa formation. This process forms tufa barriers, which are responsible for the creation of the lakes. There are 16 larger lakes and several smaller lakes. The lakes are all interconnected as if they were a ladder – they are cascading one into the other over a number of beautiful waterfalls. The 16 lakes are divided into 12 Upper (which are also larger) and 4 Lower lakes. 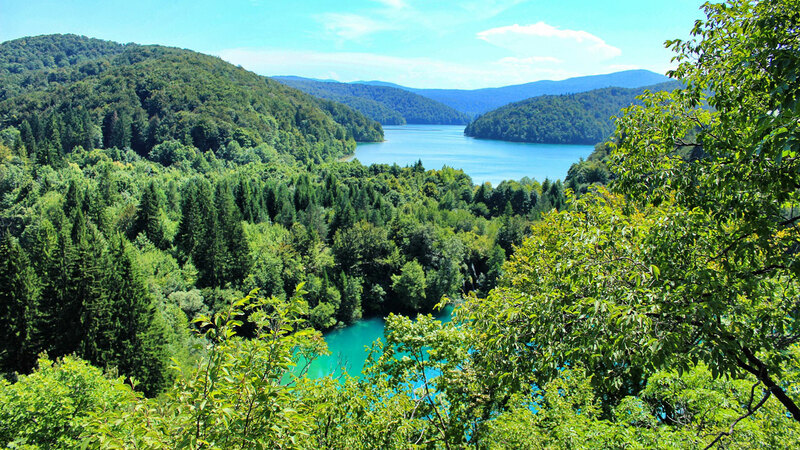 The largest lake in Plitvice is lake Kozjak. The largest waterfall in the Park (Veliki Slap) is 78 meters high, while the second largest (Galovački Buk) is 25 meters high. The lakes end in the impressive waterfall Sastavci, which falls into the Korana River. The Plitvice Lakes National Park covers the area of around 300 km2. Besides the above-mentioned lakes and waterfalls, of different shapes and sizes, there is also a lot of greenery in the Park. Thick forest, that surrounds the pristine blue and green water of the lakes, is rich in flora and fauna. It is home to more than 250 animal species and more than 1,400 plant species. Even bears and deer live in the protected area of Plitvice but they stay away from the touristic routes, of course. The value of this place was first recognized in 1949 when it became a protected area. However, it was in 1979 that the place gained international attention and was listed as UNESCO World Heritage Site. The Plitvice Lakes National Park is located in Croatia, in the interior part of the country, about 2h from Zagreb and 2h30 from Split. Upon your arrival, there are two entrances to the Park, with the ticket sales office and a parking lot at each of them. The north entrance (Entrance 1) is just above the Lower Lakes, and south entrance (Entrance 2) is next to the Upper Lakes. 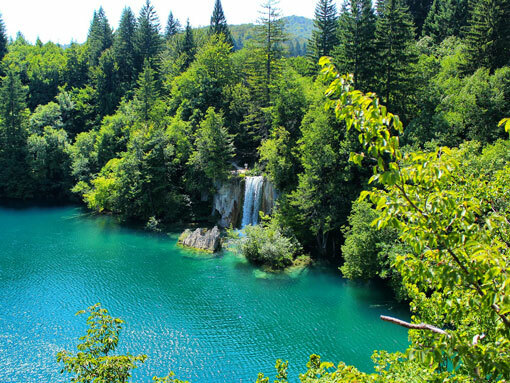 The Plitvice Lakes National Park offers visitors seven different routes to tour the lakes, as well as four hiking trails. The infrastructure of the Park is great. On the most common route (route B) there are 3 points with toilet, coffee shop, and ice cream. In addition to these points, there is a very large area with tables and benches for a picnic, where you can also buy snacks, drinks, and souvenirs. Route B lasts approximately 3 to 4 hours. It starts at the Entrance 1 and includes the walk around the Lower Lakes, a boat ride across the lake Kozjak and a panoramic train ride that will get you back to the start. In contrast to the route B, there is a route E, which offers the tour of the Upper Lakes only. It also lasts about 3 to 4 hours. The tour starts at the Entrance 2 and includes a short boat ride across the lake Kozjak, walk around the lakes and a panoramic train ride back to the starting point. Another popular route is route C, which is a bit longer than the previous two. The route includes a tour of both Lower and Upper Lakes, which gives you the opportunity to enjoy the beauty of the Park’s entire lake area. Likewise the previous two routes, route C also includes a boat drive, as well as a sightseeing train. Therefore, if you want a full experience, and have enough time, consider taking this route! In addition to the mentioned routes, there are a few more challenging routes that require better physical endurance. For more detailed tour programs visit the official website of the Plitvice Lakes National Park. 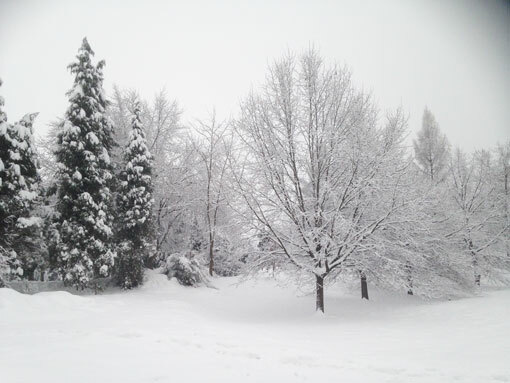 The Park is open to visitors year round. When planning your visit to the Plitvice Lakes, you should know that every season brings a different experience of the lakes. If you like to rest your eyes upon delightful green scenery then you should definitely visit Plitvice during the summer. However, if you are more of a Frozen fan then we recommend coming in winter when everything is almost completely frozen and covered in snow. You will be welcomed by a very idyllic and peaceful scene. You should bear in mind that, due to the weather conditions, certain parts of the Park can have a limited access, mainly during the winter months. In July and August the number of visitors is at its highest, so consider coming to the Park the earliest possible, to avoid the crowd. For those that prefer lower temperatures, spring seems like the best time to visit Plitvice. The weather is nice and the prices are lower than in the summer months. Prior reservation is not required for individual visitors. You can just buy your ticket at the ticket sales desk at the entrance. Ticket sales desks can be found at Entrance 1 and Entrance 2. The price of the entrance ticket depends on the time of the year, as well as the time of the day (in high season). The entrance ticket includes the selected tour, transport with the electric boat and panorama train. You can choose between one-day tickets and two-day tickets (if you are planning to expand your stay at the Park). There are two main entrances to the Plitvice Lakes National Park – north entrance, known as Entrance 1, and south entrance, known as Entrance 2. Parking is available at Entrance 1 and Entrance 2 and is paid upon exiting the Park. The price depends on the type of the vehicle and the time of your stay. Dogs are allowed to enter the Park but must be kept on the leash at all times. For more up-to-date information about the pricing, you can visit the official website of Plitvice Lakes National Park. To preserve the ecosystem, swimming is not allowed in the Plitvice Lakes National Park. Increased tourism and water pollution caused by wastewater from the facilities surrounding the lakes led to a higher rate of harmful substances within the water. For the sustainable formation of travertine, it was necessary to protect the ecosystem from excessive human influence and to forbid the swimming. However, if you want to take a dip in the crystal clear waters of the Croatian National Parks, you can visit the Krka National Park. Krka is near the city of Split, on the Dalmatian coast. Marzito organizes private tours to the national park from Split and even from other cities. When visiting Plitvice Lakes National Park, wear some comfortable shoes (never flip-flops!) because the paths can be narrow and uneven. Also, try to get to Plitvice Lakes as early as possible to avoid the crowd. The Plitvice Lakes National Park is located in the mountainous region of Lika, roughly halfway between Zagreb, the capital of Croatia, and the Adriatic coast. The Park is just a couple of hours drive from Zagreb or Rijeka, and about 1h30 from Zadar. Split and Dubrovnik are a bit further – it takes 2h30 from Split to Plitvice and about 4h30 from Dubrovnik. Because of its central position, Plitvice Lakes is perfect for a one day trip no matter where you stay. It is also possible to stop at Plitvice and visit the lakes during your transfer from Zagreb/Rijeka/Ljubljana to the Adriatic coast because they are right on your way! You can get to Plitvice Lakes by car, public bus or organized transfer. Unfortunately, no train goes to Plitvice and the closest airport is the one in Zadar (130 km from Plitvice). If you are arriving by car, take a motorway A1 from Zagreb to Karlovac. From Karlovac take a state road D1 (direction Slunj/Grabovac/Plitvice). Plitvice is about 80 km south of Karlovac. If you are heading to Plitvice from Zadar/Split take a motorway A1 (direction Zagreb/Rijeka). Exit at Gornja Ploča and continue on a state road D522. Finally, take a state road D1 from Udbina to the Plitvice Lakes (direction Plitvice). If you are driving from Rijeka, get on a motorway A7 and then continue on A6 (direction Karlovac). Exit at Bosiljevo and head south on the road E71/A1 (direction Split/Senj/Ogulin). Next, take exit 7 for D42 (direction Josipdol/Plitvice). If you’re arriving by public bus, check out the links below for the detailed bus schedules and plan your trip! If you are interested in staying near the Plitvice Lakes National Park, there is a number of hotels and private accommodation available both in the Plitvice Lakes area and in the nearby villages. This is one of the hotels situated close to the Park’s protected area. Hotel Plitvice has an interesting architectural design and is great for bigger groups since it has a larger accommodation capacity. Besides that, it has a restaurant, a souvenir shop, free parking, and free Wi-Fi. Hotel Jezero is another hotel situated in the central zone within Plitvice Lakes National Park. It is much bigger than the previous one and offers accommodation for about 400 guests. The hotel includes a restaurant, a cafe, and a fitness hall. In addition, the hotel complex offers a range of sports and recreation activities. you can explore and book your accommodation here. This accommodation is perfect for those that love a dash of luxury while traveling. Fenomen Plitvice is located just next to the National Park area, which means that you are surrounded by a beautiful nature at all times. Here you can book a suite, a studio, or even a lodge. What’s more, there is also a restaurant in the complex, so you can have a full experience in one place. More information available here. Hotel Degenija is situated only 4 km from the Plitvice Lakes National Park. The hotel is modern and spacious and has two on-site restaurants and a bar. There is a free parking available, as well as a pool and free Wi-Fi. In addition, the hotel offers a private shuffle from/to the Zagreb airport. Get more info and book here. Located only 10 km from the Plitvice Lakes, in Grabovac, the 16 Lakes Hotel offers you more than a comfortable stay. Whether you are staying for one night or more, this modern hotel offers you full service. Free Wi-Fi, free parking, a pool, a bar, and a restaurant are just some of the amenities they provide. If you want to know more, follow the link. After spending your day in nature, exploring the lakes, there is nothing better than sit, relax, and eat a nice meal. There are a few restaurants near the Plitvice Lakes National Park, mainly located within the hotels, such as Hotel Plitvice, Hotel Jezero, Hotel Degenija, etc. 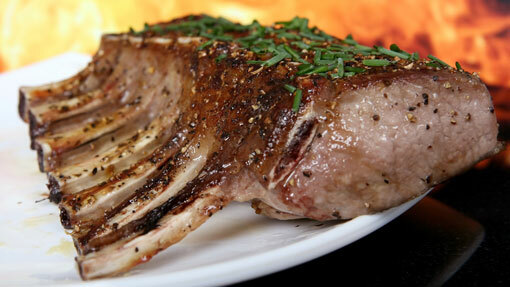 Most of those restaurants serve a wide range of meals – you can basically get anything from pasta to roast. However, since the food here is mostly based on meat, we encourage you to taste a real deal and visit one of the more traditional restaurants in the region. Below is a list of our favorites! Lička Kuća is a traditional restaurant of the Lika region, therefore it serves traditional food, such as lamb baked under the iron bell, grilled dishes, roasted potato halves, trout, Lika cheese, apple or plum strudels, etc. Besides the tasty food, you can also enjoy traditional architecture and get to know more about the Lika region. Furthermore, it is located right at the north entrance to the Park. Check it out. 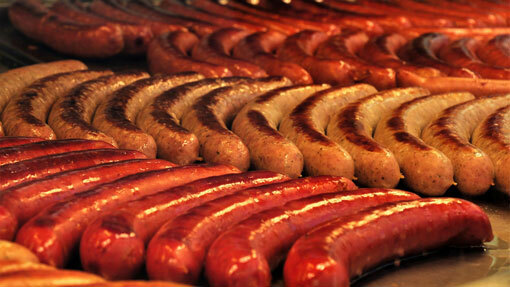 If you get hungry while touring the lakes, take a break at Kozjačka Draga. This bistro is located within the Park, on the shores of lake Kozjak. On a wide green field, you will find a bunch of picnic tables – pick one and enjoy a tasty meal with the perfect view. Click here for further detail. Do not depend on the strategic rest points in the Park. We recommend that you take your own water bottle and even some snacks, such as fruit or cereal bar, to make your tour more enjoyable. While on the road from Zagreb to Plitvice Lakes, we recommend to make a stop and visit a stunning little village of Rastoke (near Slunj) and enjoy a walk or a coffee at this picturesque place. You can get more information here. Another option is to visit the Barać Caves (near Rakovica) that are just 20 minutes drive from Plitvice Lakes. There you will get to know everything about speleology and the inhabitants of the caves – bats! More info available at the website. For those of you that are brave enough and love the adrenaline rush, we recommend visiting Sports/Recreation Center The White Peak. The center is located just a few minutes drive from Plitvice Lakes and it offers activities like Zip Line, climbing or cycling in the area of 100ha. If we got your attention, visit their website. If you have an extra day to spare, consider visiting Karlovac, a nice town located only 40 km south of Zagreb. Karlovac is known as the town of parks and rivers – it has four rivers flowing through it, which gets very handy during the summer months. You can try swimming or even rafting in one of them. Furthermore, you can enjoy your walk through the central part of the town, the so-called star, which was built in the 16th century as a Renaissance fortress. Since Karlovac is inevitable on your way to the Plitvice Lakes, why not expand your trip? Check it out here. Finally, history enthusiasts can also visit Turanj Military Complex located just a few kilometers down the road from Karlovac towards Plitvice. You will learn everything about the military past of the city of Karlovac – from the 16th century to the Homeland War. More information available here. Marzito organizes private day-trips or private transfers to Plitvice Lakes from Zagreb, Ljubljana (Slovenia), Zadar, Split, or any other town.